Oregon home builders bring a modern take on bungalow rowhouses in northeast Portland. 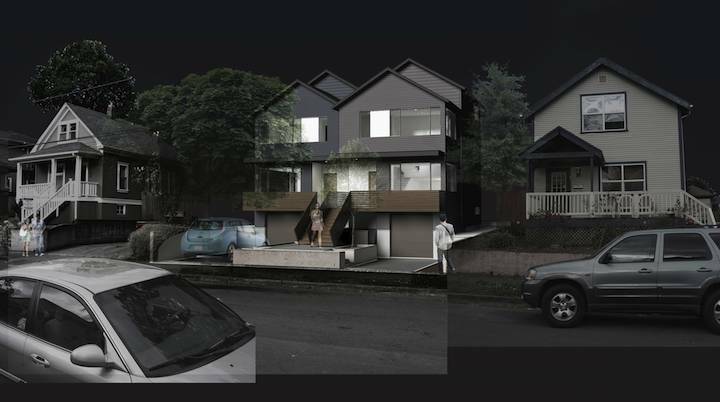 Conveniently located on NE 8th Avenue, near NE Fremont, these latest rowhomes are ideally located near public transportation, trendy hotspots and the Irving City Park. Designed by Reworks Architecture, the rowhouses are 2,100 square feet, spacious and stylish. Each home has three bedrooms, two and a half bathrooms, sustainable concrete floors and a garage on the main level. In addition to the 10-foot ceiling on the main floor, you’ll find a three-story shaft of light that reaches from the roof down to the floor so you get a flood of natural daytime illumination. Reworks is a Portland metro-based firm that’s committed to building well-crafted livable communities with distinctive designs. 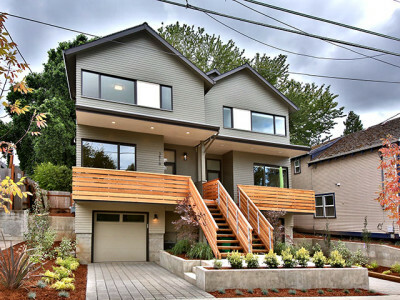 Its sustainable building principles made Reworks a great fit for the Portland home builders at H. Hudson Homes. The two firms worked together to create a complementary neighborhood infill with details that make them better than anything you’ve ever seen in a rowhouse. You owe it to yourself to take a look.